Description: Cap 5 to 15 cm across, convex to flattened, margin inrolled; vinaceous, dark to reddish violet brown when young, fading to brown to dark brown; moist to soon dry, woolly or even squamulose. Pores yellow-white to olive-yellow; depressed around stem; not staining or staining slightly darker yellow when bruised. 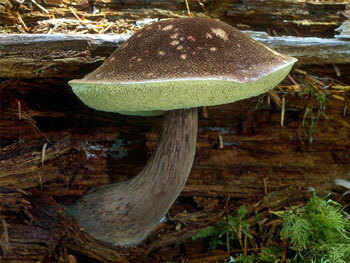 Stem 80 to 150 x 35 to 50mm; bulbous to club shaped; dry; dark to reddish brown with darker striations. Flesh firm; white, yellow with grayish red streaks in stem. Odor and taste pleasant. Spore print olive-brown. Habitat: On or near logs or woody debris of fir, hemlock or western red cedar, September to December. Primary Keys: Bolete round pores; red/brown velvety cap; yellow pores not staining blue; dark reddish-brown stem with streaks; grows on wood. Edibility: Good. It has a slight lemony note under a mild bolete flavor. Notes: This distinctive and common bolete is easy to identify. B. chrysenteron has a lighter cracked cap, while B. zelleri has a more red cap. Both have more yellow in the stem with fewer if any striations, the pores typically stain blue, sometimes slowly, and they are terrestrial, not wood-lovers. All are frequently attacked by the white-to-yellow cottony Hypomyces chrysospermus, a cousin to the Lobster Mushroom. B. mirabilis — like other boletes — is an excellent mushroom for drying. And like other boletes, beware of worms! Cook the linguine in plenty of well-salted boiling water. Pre-heat a large saute pan over medium high heat. Saute the garlic for 30 seconds in 2T. olive oil. Add the mushrooms, lemon zest and juice, thyme, salt and pepper and cook for another 2 minutes.